John Bonney heads outreach at the Neptune Public Library. Coaster Photo. John Bonney’s personal mission in life is to make a difference in the lives of others through kindness. 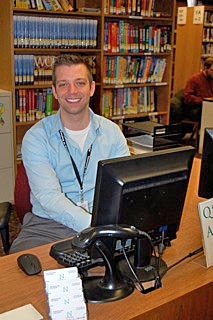 In the past three years he has implemented that mission into his work at the Neptune Public Library, where he heads outreach and will soon serve as assistant director. In 2010, the Neptune Library officially began their One-on-One Program and now, three years later, the program has captured the attention of the State Librarian, Mary Chute. The One-on-One Program is designed to meet the needs of the community beyond the typical “reference desk” questions and queries. Patrons can make personal appointments with Bonney or Library Director Marian Bauman for tutorials on how to use the latest technology, including e-readers, tablets, and computers – or how to access free lifelong learning communities such as Massive Open Online Courses. Most importantly though, in a state with an unemployment rate higher than the national average, the One-on-One program provides free assistance with online job searching, resume editing, and even help with filling out online job applications. Making the appointment is as easy as calling, emailing or just stopping into the library. “I’ve never turned anyone down” said Bonney, who has helped people from beyond just the Neptune community. He hands out three of his business cards at the end of each appointment and asks that they be given to friends or family who might benefit from the library’s services. Maybe it’s word of mouth, or maybe it’s their partnership with the Monmouth County One-Stop Career Center on Taylor Avenue in Neptune, but the program’s success can be seen clearly in the numbers. In 2010, the library had 162 appointments. In 2013, as of October, the library has had 856 appointments. Bonney is confident that by the year’s end, they’ll have held 1,000 successful appointments. Just this past month, a woman he assisted in October with searching for and applying for part-time work as a social worker, was hired. “We’re sharing the success of those stories of folks who find employment with the New Jersey State Librarian [Mary Chute] and trying to get our message across to legislators in how valuable libraries are in filling that employment gap,” Bonney said. It is his hope that through this program and their work with Chute, they can form awareness that although much of the public sector is hurting, public libraries are making a difference and that they are much more than just books. Posted in Shore Communities and tagged Katharina Cavano, Neptune.